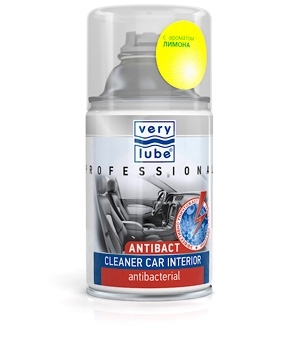 Effective product for antibacterial treatment and elimination of unpleasant odors in the car compartment. Deodorizes and disinfects interior compartment space, air ventilation and conditioning system. 1. Start the engine. Open all air ducts. Cut off air intake from without. Shut windows and doors. 2. Provide operation of the air ventilation (conditioning) system in the maximal air circulation mode. 3. Shake the can; place it in vertically in the centre of the car compartment (armrest, central console). Push the valve until it is fixed in the open position. 4. Leave the car, wait 15-20 minutes.